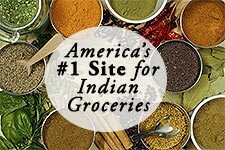 Amla Juice, also known as Indian Gooseberry juice, is a popular Ayurvedic herbal drink. It is rich in Vitamin C (nearly 20 times that of an orange!) and used to cure an array of ailments. 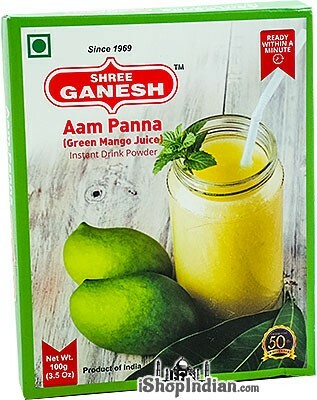 Ingredients: Amla/Indian Goose berry (emblica officinalis) Juice (100% pure as nature intended), less than 0.1% (each) sodium benzoate and potassium sorbate (to preserve taste). As pure as a nature intended, 24 Mantra Organic Guava Nectar is low in fat and rich in Vitamin C, which makes it the perfect drink for the whole family. 24 Mantra organic juice is just what Nature ordered. It is pure, natural and free of pesticides and chemicals. No artificial ripening or hastening of the processes, best practices of storage and processing reaffirm 24 Mantra’s commitment to all qualities organic. Ingredients: water, organic guava pulp (25%), organic sugar, citric acid (E330), Ascorbic acid (E300), and natural guava flavor. 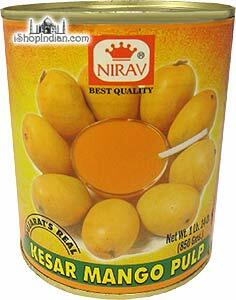 100% Pure and USDA Organic Certified "Kesar" variety of mango pulp originating from the mango capital of "Gujarat." 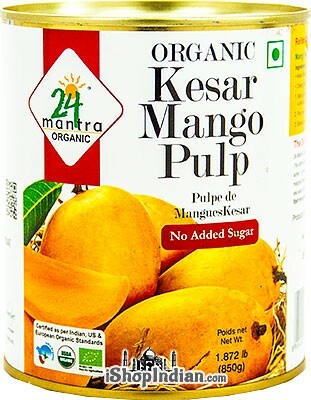 Enjoy pureed organic mango pulp without any added sugar, and enjoy mangoes as nature intended. Recipe provided on tin for Mango Milk Shakes and Mango Lassi. Enjoy with ice cream or in pies for a more adventurous mango delight. Ingredients: Organic Kesar Mango Pulp Only. This Mango fruit beverage is made from the best organic fruits. We grow them without synthetic pesticides and fertilizers. No added artificial preservatives or flavors. Our organic farming methods and stringent practices ensure we monitor the food every step of the way. So sit back and enjoy a beverage that tastes as good as fresh. Mango juice builds immunity of the body and reduces the risks of diseases. Rich in vitamin A, Vitamin C and carbohydrates, mango juice also provides the body with minerals such as calcium and iron. Chemicals present in the mango juice help in eliminating free radicals, and help in the formation of healthy teeth and bones. Ingredients: water, organic mango pulp (25%), organic sugar, citric acid, vitamin c, mixed carotenoids, natural flavor. 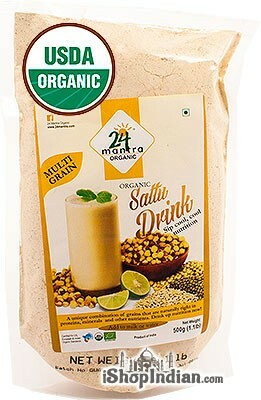 A unique combination of grains that are naturally right in proteins, minerals and other nutrients. Drink up nutrition now. Ingredients: Jaggery powder, brown chana, barley, moong bean, soybean, cardamom. 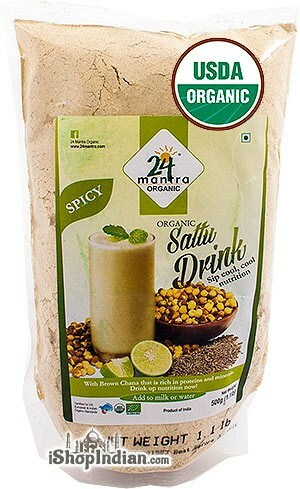 To make a glass of beverage: To 3 tbsp of sattu, add hot/warm or chilled water, stir and drink. To make laddus: To a cup of sweet sattu, add 2 tbsp of hot melted ghee, mix and make balls. With brown chana that is rich in proteins and minerals, drink up nutrition now. This is a combination of roasted brown chana with jeera (cumin). This is cooling for the body and gives you sustained energy. Naturally high in proteins, minerals and other nutrients. To make Sattu Paratha: To sattu, add ginger paste, chilly, ajwain, salt, mix and make into small balls, place it in between chappati dough to make tasty and healthy parathas. Apple Sidra is popular carbonated soda beverage with a unique apple flavor. The Apple Sidra Soft Drink has been popular in Pakistan for centuries and needs no introduction. 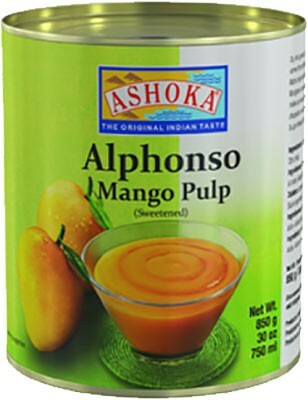 Sweet Mango Pulp from India's king of fruits, the Alphonso mango. Perfect for mango drinks, lassis, pies and ice cream. Ingredients: Alphonso Mango Pulp (94%), Sugar & Acid: Citric Acid. $4.49 Notification will be sent to your e-mail address every time the item price is decreased. Boost Energy Drink Mix is India's leading malt-based Health Food Drink in a chocolate flavor. New Boost is charged with Advanced Energy Boosters - iron, zinc and magnesium along with other key vitamins and minerals that give extra energy. Boost tastes delicious hot or cold! 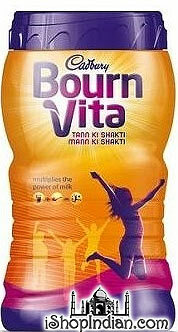 Cadbury's Bournvita is a malted chocolate drink mix that can be enjoyed piping hot or deliciously cold. Try blending Bournvita with milk and ice cream to make a chocolate milk shake that is delectable and nutritious. This is the unsweetened liquid extracted from coconuts. It plays an essential part in many South Indian curries, soups and sweets. 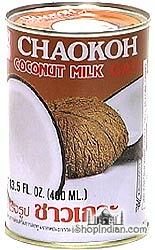 This coconut milk can also be used to make cakes, candies, cookies, ice cream, coconut jam (kaya), curries and other preparations where coconut milk is required. Complan is much more than a nutritious drink. It is a complete planned meal in a deliciously flavored drink. Easy to prepare. Each cup of Complan contains a balanced combination of all 23 vital nutrients your body needs everyday. It is therefore an ideal supplement for those with special nutritional needs. Complan works best when taken regularly, everyday. This particular drink is chocolate flavored. Complan is much more than a nutritious drink. It is a complete planned meal in a deliciously flavored drink. Easy to prepare. Each cup of Complan contains a balanced combination of all 23 vital nutrients your body needs everyday. It is therefore an ideal supplement for those with special nutritional needs. Complan works best when taken regularly, everyday. Get a jump start on your day by filling up with the extra energy of Dabur Glucose-D. High-grade Glucose D in enriched with the goodness of Vitamin D and Calcium for extra quick replenishment of essential vitamins, minerals and body salt. A Replenisher: For quick recovery of energy lost due to fatigue. An Energizer: An energy boost for that extra effort that sets the winner apart. A Guardian: Provides essential nutrients. Refreshes and energizes to fight tiredness and fatigue caused by heat. Especially beneficial for athletes and children. 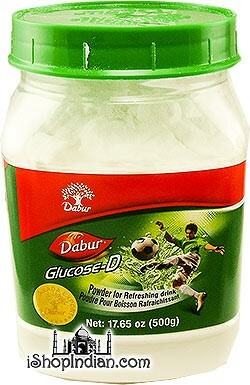 Add Dabur Glucose-D to water, fruit juices, lemonade, fresh fruits and your everyday favorites. This is the sweet, golden pulp derived from Indian Alphonso mangoes. It is great by itself, or warmed and poured on ice cream. It also makes a great ice cream shake when added to vanilla ice cream. It is often used in sweets and yogurt drinks. Ingredients: Alphonso Mango Pulp (94%), Sugar (5%), water, citric acid. Aampanna (Green Mango Drink), is a favorite tangy, thirst-quenching drink across India. Enjoy "Deep Green Mango" drink, with its delightfully sweet and sour, 'Khatta Meetha' distinctive flavor on a warm summer day. It is made with at least 10% fruit juice, sugar, lemon juice, black salt and green mango and lime flavors. This is the sweet, golden pulp derived from mangoes. The pulp is extracted from "kesar" mangoes, a sugary variety native to North India. It is great by itself, or warmed and poured on ice cream. It also makes a great ice cream shake when added to vanilla ice cream. It is often used in sweets and yogurt drinks. 1. In a pitcher or large bowl, combine the yogurt, milk, water, mango pulp, cardamom powder and sugar. Whisk briskly until completely mixed. Chill. Lassi can be poured over ice, or blended with ice. Sprinkle pistachios on top before serving. This spiced sweet tangy syrup with deep purple hue is made with jamun or Indian blackberry flavor. In India it is commonly known as ‘Kala Khatta syrup’ and is used to make ice lollies, popsicles and sharbat. Ice lolly is also known as ‘Gola’ and you can enjoy it in varied flavors during summers at many street stalls. One of the most popular flavor of gola is ‘Kala khatta’ as it is not only sweet but a mix of tangy, salty and mild spicy flavors due to little bit of lime juice, black salt, cumin seed powder and a generous use of jamun syrup. So make this kala khatta syrup with our simple to follow recipe and stay cool in summers. Ingredients: sugar, water, citric acid, contains permitted color and added flavors, food color allure red 40, brilliant blue no 1, yellow no. 5. A more intense and stronger Thums Up with extra caffeine. Strong, fizzy, and slightly spicy to suit your desi palate. It tingles and adds a spicy twist to meals and snacks. Never give up, take charge with Thums Up Charged. Enjoy your own Thums Up thunder in a can, even on the go. It is best served chilled. 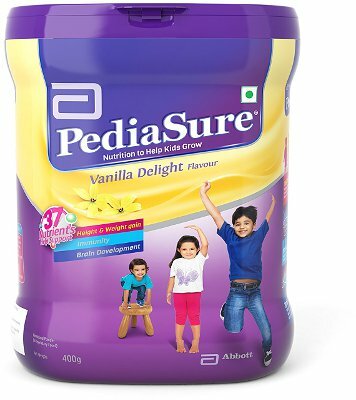 PediaSure is the nutrition specialist trusted by mothers in India and over 80 countries. The unique formula of PediaSure provides complete and balanced nutrition. Pediasure helps fill the nutrition gaps that can arise out of a child’s fussy eating behavior. Mothers around the world trust and use PediaSure to fill nutrition gaps arising out of their child’s fussy eating behavior. This trust is a result of PediaSure’s superior product formulation with 37 vital nutrients fortified by Prebiotics and Probiotics and Choline and Taurine. PediaSure also meets 100% of the requirements * of vitamins and minerals for children above 2 years when consumed in adequate amounts. PediaSure is clinically tested by scientists, researchers and doctors to help increase height and weight** and strengthen natural immunity in children. *** These findings have been verified and published in scientific journals that are read by pediatricians around the world. Ask your pediatrician today to make the right choice of nutritional supplements for your child. After all, your child deserves the best and as a concerned parent, so do you. As a parent, you are always worried about your child's fussy eating. Fussy eating may lead to inadequate intake of nutrients, which over a period of time may affect a child's health and overall growth1. PediaSure with 37 vital nutrients can be your choice, as you seek to ensure adequate nutrition for your fussy eating child. Pediasure provides complete and balanced nutrition and is clinically increase height and weight versus children who did not consume Pediasure. Fussy eaters at nutritional risk fed Pediasure as a supplement experienced 45% fewer upper respiratory infection than those un-supplemented with Pediasure**. Pediasure, fortified with a unique blend of FOS and Probiotics to help strengthen children's immunity, is clinically proven to reduce number of sick days by 29% in children 3-5 years of age. Pediasure contains Omega 3 and Taurime and Choline. If prolonged, fussy eating behaviours may create a risk of nutritional gaps in your child's diet. 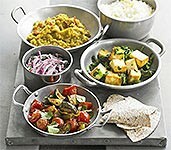 Complete and balanced nutrition can fill those gaps and support healthy growth and development. Pediasure can be used as a nutritional supplement with or between meals. The most crucial phase of a child’s growing years is 2 to 10 years of age. During this period, children undergo a significant increase in physical development and mental development. Many children are poor eaters who exhibit strong likes and dislikes for certain foods or have small appetites. Your children’s fussy eating may lead to nutrition gaps affecting their growth. Take the test below to find out if your child is a "Fussy Eater". $19.99 Notification will be sent to your e-mail address every time the item price is decreased. 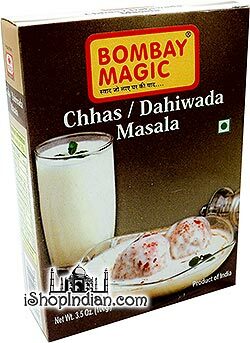 Instant Falooda beverage mix with Rajbhog flavor. Just mix with milk and enjoy! INGREDIENTS: Sugar, water, vermicelli, subja seeds, CITRIC ACID INS 330, CONTAINS PERMITTED CLASS PRESERVATIVE INS 211, CONTAINS PERMITTED NATURAL FOOD COLOUR 150D and added nature identical flavors. Direction of Use: (1) Mix 1 part Tingle Falooda Syrup with 5 Parts Milk (2) Float ice cream scoop, make it yummy (3) you can also top your ice cream directly with Tingle Falooda. Dress with dry fruits. Instant Falooda beverage mix with Figs and Cashew flavor. Just mix with milk and enjoy! INGREDIENTS: Sugar, water, vermicelli, subja seeds, CITRIC ACID INS 330, CONTAINS PERMITTED CLASS PRESERVATIVE INS 211, CONTAINS PERMITTED NATURAL FOOD COLOUR 150D and added nature identical fig and cashew flavors. Direction of Use: (1) Mix 1 part Tingle Falooda Syrup with 5 Parts Milk (2) Float ice cream scoop,make it yummy (3) you can also top your ice cream directly with Tingle Falooda. Dress with dry fruits. Instant Falooda beverage mix with Kesar Pista flavor. Just mix with milk and enjoy! INGREDIENTS: Sugar, water, vermicelli, subja seeds, CITRIC ACID INS 330, CONTAINS PERMITTED CLASS PRESERVATIVE INS 211, CONTAINS PERMITTED NATURAL FOOD COLOUR 150D and added nature identical kesar pista flavors. Instant Falooda beverage mix with Butterscotch flavor. Just mix with milk and enjoy! INGREDIENTS: Sugar, water, vermicelli, subja seeds, CITRIC ACID INS 330, CONTAINS PERMITTED CLASS PRESERVATIVE INS 211, CONTAINS PERMITTED NATURAL FOOD COLOUR 150D and added nature identical butterscotch flavors. Aampanna is a raw mango drink made from mangoes that are more tart than sweet. The added spices make this a unique and refreshing drink. Just add water and enjoy. Makes 5 servings. INGREDIENTS: Sugar, Dextrose, Mango, Malto Dextrin, Dry Mango, Black salt,Ginger, Cumin, Black pepper, Thickening agent, Acdifying agent, Mint , Sweetener, Permitted flavour, Natural colour, Anti cakinng agent. Do not freeze, keep in a cool & dry place. Use within 15 days after opening the pack. no chemical preservatives.